Hiking Rocky Mountain National Park: Bluebird and Ouzel Lakes. This week my sister Jane and her boyfriend Troy were in town from New York. I must credit my sister with lighting my hiking bug. It was only last summer that she visited and persuaded me to hike in RMNP, and I was pretty much instantly hooked. 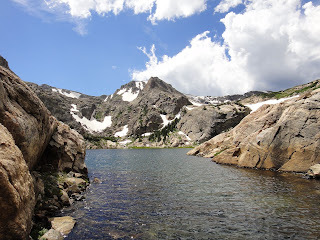 Our first hike started from the Bear Lake trailhead and ended at Lake Haiyaha, which is probably better known in some circles for the wealth of hard bouldering it and the surrounding area contains, rather than being a hiking destination. Our second hike started from the Wild Basin trailhead. I was somewhat familiar with it as my wife and I would occasionally head there to test ourselves by climbing on the Wild Basin boulder. I consulted the books my parents had purchased for me on hiking in Colorado (why they bought them I don't know; I had zero interest in hiking at the time). 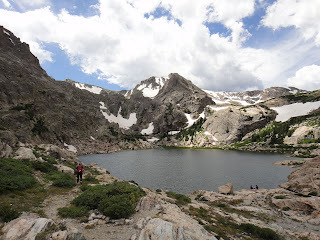 I decided that Ouzel Lake looked like a worthy destination. Long, but not too long and sure to end with a great sight. We went and I loved it. Within a month I had hiked my first thirteener, Isolation Peak. But by now it was September and the winter came.... But that left me more for this summer. 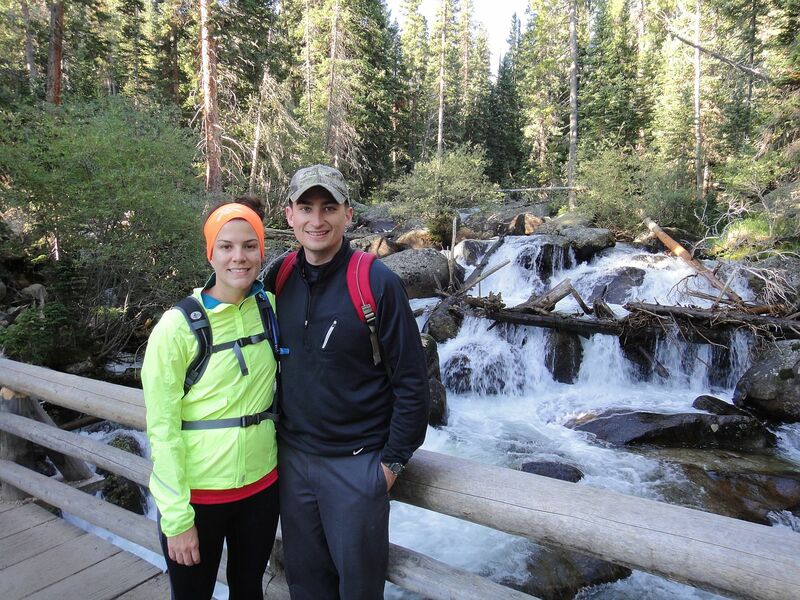 This year we rented a cabin in Allenspark, with the intent of spending several days hiking in the park. This of course, greatly reduced our transit time from Boulder and or Longmont. We got up relatively early with the intent of summiting Copeland Mountain. 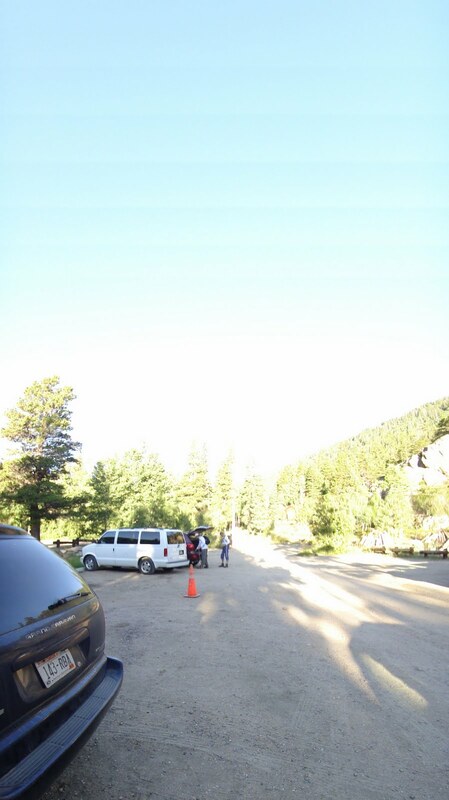 Wild Basin trailhead at 7am. 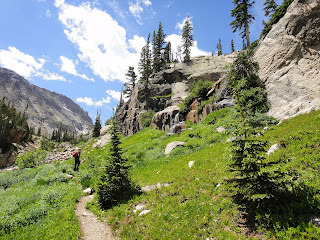 Our day started like many of my hikes along the Thunder lake trail. 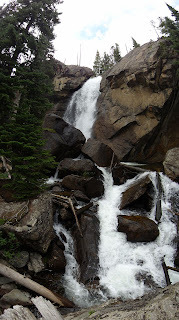 There is a mellow but noticeable rise from the parking area and very shortly you hit Copeland falls. 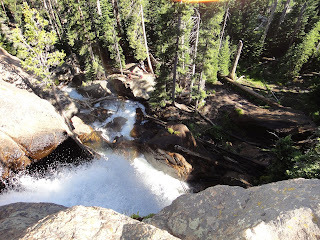 It is worth it to check the falls out, though if you are heading up, you will hit a much larger and more spectacular waterfall in a little while. Soon enough you'll hit a sign for the Pine Ridge camp ground, and shortly after a sign for the campground trail. I am not sure if many know this because it is not labelled, but this is a through trail, and if you are headed to Thunder Lake or Lion Lake and surrounding destinations, it is a good one to take as it will cut off almost .75 of a mile in distance at the expense of some of the great views you'll get on the Thunder Lake trail. Here the trail turns up a notch and you'll have some steps to climb before you reach Calypso Cascades. This area is named for an orchid that grows here. It is a great place to stop for a bite to eat and the air can feel ten or more degrees cooler standing on the bridge with the water rushing under you and a little spray hitting you. Jane makes a funny face. The trail winds and you will head through an area burnt by a forest fire in 1978. The lack of tree population allows some great views of Mount Meeker and Longs Peak to the north, and Pagoda Mountain, Chiefs Head Peak, Mount Alice, and Mount Orton to the northwest. Next you'll arrive at a prime tourist stop: Ouzel Falls. Ouzel Creek dumps about forty feet here and depending on what time of year you arrive, it can be anything from a healthy but modest water fall to a mini Niagara! I'll get back to this, as we stopped at it on the way back down. Follow the trail around to some neat lightly overhung cliffs. The trail actually loses a little elevation here, but it makes up for it when you soon hit the junction for the Bluebird Lake trail. This trail is pretty steep, but after a short climb you'll reach a plateau in the middle of the aforementioned forest fire burn area. This section of the trail can be pretty brutal, not from difficulty, but because you are 100 percent exposed to the sun for a good amount of time. Make sure you have enough water, sunscreen, a hat, and maybe a light jacket in case of wind. A break in the little bit of shade in the forest fire area. Copeland Mountain dominating the view to the south west. 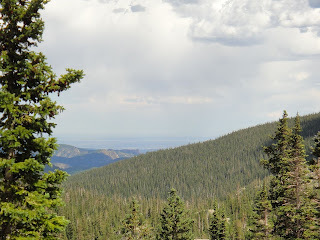 But from here it is only a little farther to Ouzel Lake. Continue on the trail until you reach a sign marking the junction with the Ouzel Lake trail. Head left for Ouzel Lake. Ouzel Lake is a very scenic and calm lake at 10020 feet. Pine trees and marsh surround it and you'll get a great view of the north face of Copeland Mountain. More often than not, the surface is nearly glass smooth, allowing you to view the many fish which populate it. 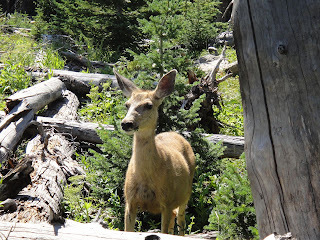 We saw this deer about ten feet off the trail. If your goal is Bluebird Lake, continue on and prepare yourself. 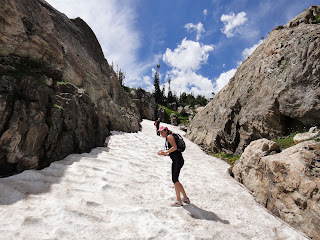 The trail is much steeper in places and more rugged in general. You'll gain almost 1000 feet over the next two miles. Spend a little more time in the sun before you start to hit some larger trees, and I swear the temperature feels ten or more degrees cooler in the shade. 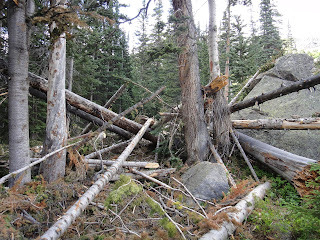 You'll soon make it back to full forest, and soon after hit this mess, the result of a Spring 2011 avalanche. When it'll be cleaned up, I know not. For now you'll be on the trail and then lose it with a large boulder in front of you. I skirted to the right of this and then cut west after it. Carefully climb over some downed trees and head north while looking to your west. It did require a little trail finding but with any luck you'll see the trail. If you hit the small stream, you're probably below the trail, so head up looking left. ...you'll start to hit some granite benches and at times the trail is marked by cairns, so keep your eyes open. 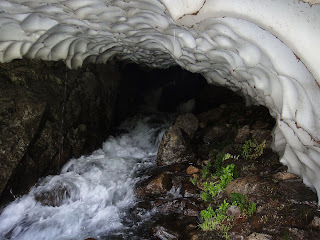 We noticed this pretty neat feature at a crossing of upper Ouzel Creek. Snowfield cut by Ouzel Creek. You'll reach a small ridge and a bunch of rocks and think 'this is it!'. It's not, but you are very close now. The final approach to the lake is marked by this area, currently a snow field. 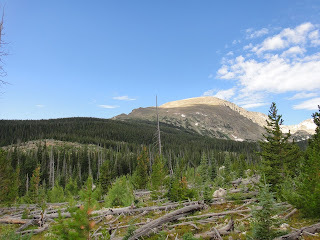 To observe the fragility of the sub alpine ecosystem, people have been climbing the granite bench to the right of this picture, and there is already a trail beat in. Please stay on the trail! Copeland Mountain, Ouzel Peak, and Mahana Peak surround the bowl containing Bluebird Lake. 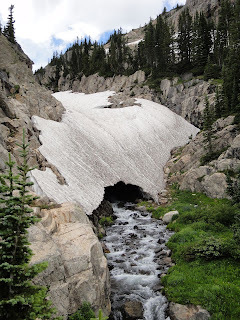 Up from the outlet to Ouzel Creek. Have lunch, pump some water, take a load off and prepare to hike back down. Your elevation allows you to see east all the way to the plains. What a great view! Looking back up, Copeland Mountain on the left, Ouzel Peak center. Ouzel Falls is a very popular destination. The hike is shorter, and doesn't gain all that much elevation and the end goal is very much worth it. If you have younger/older/less in shape people in your party, the hike up and back can take several hours, but I would say it is easy. This season the falls have been roaring due to the tremendous amount of snow melt still happening. To the left of the bridge, rock hop and find your way up to get a close up view of the falls. For a different perspective, follow the cliff face holding the falls to the west. There is a unofficial trail there that will take you around and then up. You wind up standing on top of the falls looking down. Kind of scary! Jane and Troy way down there. 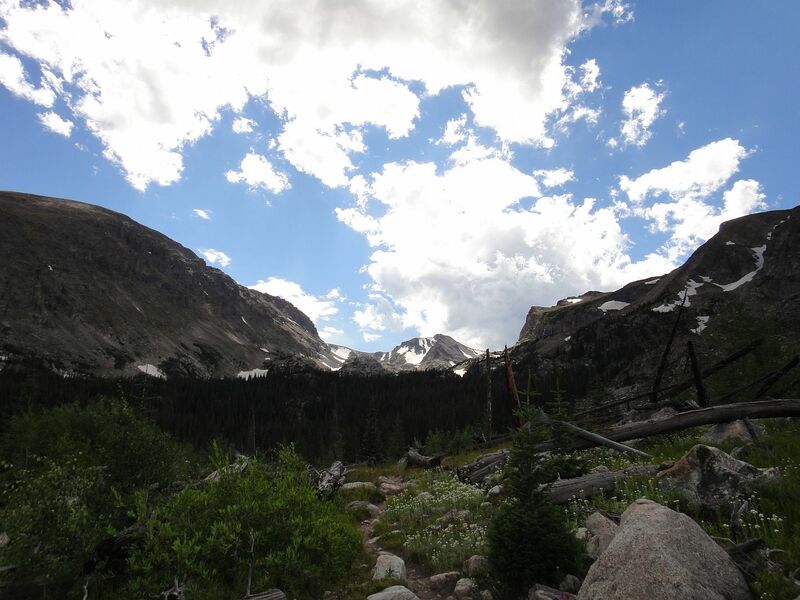 Make your way back to the trail and back down to the Wild Basin trail head. Eat a big dinner, you've earned it! .3 miles one way, negligible gain. Super easy. 1.9 miles one way, 780 foot gain. Easy. 2.7 miles one way, 960 foot gain. Easy. 6.4 miles one way, 2478 foot gain. Strenuous.